TOOTHPICKS, not toothbrushes, were the common means of dental care when Meyer L. Rhein graduated from Union University in 1880 with a degree in medicine. He was strongly interested in oral hygiene. After spending another year at a college of dentistry, he opened an office in New York as a dentist. Convinced that cavities between teeth and in back teeth could be avoided by proper cleansing, Dr. Rhein decided to remedy matters. One reason why so few people used a toothbrush was that it didn’t seem to work. The bristles were trimmed in a straight line, the handle was straight, the tip of the brush couldn’t reach around the last molars. Nature had set teeth in an arch. Let’s conform to nature, said Dr. Rhein. He decided that the rows of bristles should be curved to rub with equal vigor against several teeth at a time. The bristles should be serrated to get at the surfaces between the teeth, with an extra-large tuft at the tip as a wise way of getting at the wisdom tooth. The handle should be curved so that the brush could reach into the mouth. And tapering the thickness of the back of the brush would make it easy to go past the muscles of the cheek. 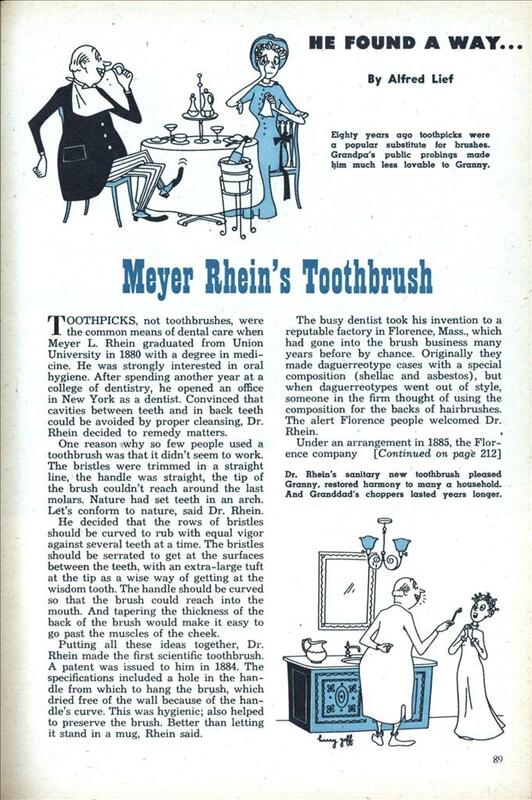 Putting all these ideas together, Dr. Rhein made the first scientific toothbrush. A patent was issued to him in 1884. The specifications included a hole in the handle from which to hang the brush, which dried free of the wall because of the handle’s curve. This was hygienic; also helped to preserve the brush. Better than letting it stand in a mug, Rhein said. The busy dentist took his invention to a reputable factory in Florence, Mass., which had gone into the brush business many years before by chance. Originally they made daguerreotype cases with a special composition (shellac and asbestos), but when daguerreotypes went out of style, someone in the firm thought of using the composition for the backs of hairbrushes. The alert Florence people welcomed Dr. Rhein. , Under an arrangement in 1885, the Florence company [Continued on page 212] undertook to make the unique toothbrush. For the curved handle it was necessary to use the thigh bones of cattle. The inventor made no bones about it—he insisted on this particular shape. A workman sat at a chuck with the piece before him and bored tiny holes, steadying his hand to get three almost even rows for the bristles to be stuck in. 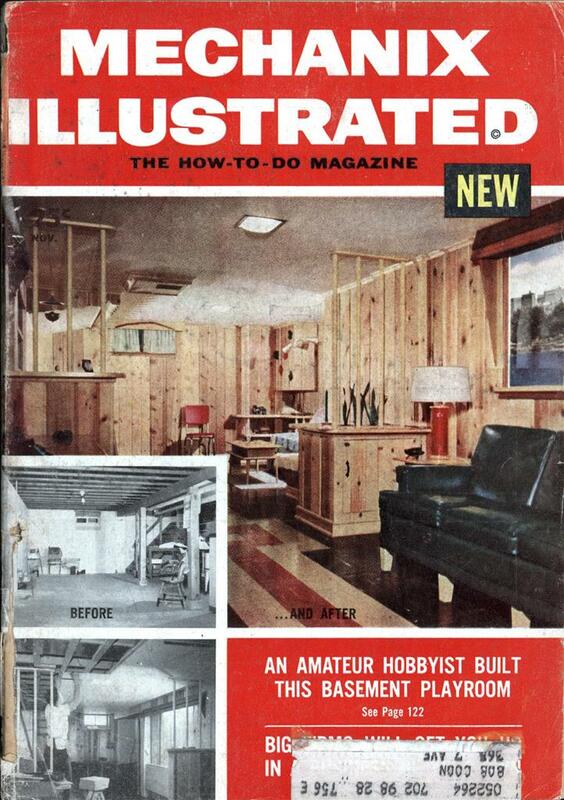 The brush was packed in an individual yellow pasteboard box, a sanitary innovation, and it was called Pro-phy-lac-tic. Sales were sparse. In 1891 they totaled only $12,000. That year Dr. Rhein disposed of his interest to the company and turned his active mind to other inventions whose need arose from his practice. Some were dental instruments. Another, a cluster of lamps to afford concentrated light on the patient’s mouth, was called Rhein Lights. Introduced early in this century, these lights became the symbol of a dental office. As the campaign of education proceeded, especially with school children, the use of the toothbrush became a daily habit, abetted by the promotion activities of dentifrice manufacturers. The combined advertising efforts brought a steady increase in the percentage of the population buying toothbrushes. Market researchers estimate it is more than 50% today. Automatic machines have displaced handwork almost entirely in mass-producing the brushes for this large market. Other changes have come about in the materials used. The bristles, formerly obtained from the backs of wild boars in China and Siberia, are now made principally of longer-wearing nylon. Toothbrush manufacturers don’t tell each other their production figures, but the best guess at total U. S. annual purchases is 120 million. Fellow scrubbers of America paid more than $45,000,000 for them last year. Dr. Rhein not only kept up his practice—he pioneered in the science of root canal treatment, was a leader in a crusade to improve the ethics of his profession, and never ceased in his efforts to further the cause of oral hygiene. It’s a sure thing he never missed a day in brushing his own molars.